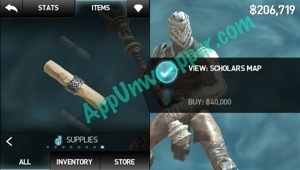 The new Vault of Tears update to Infinity Blade 2 brought with it the introduction of treasure maps. 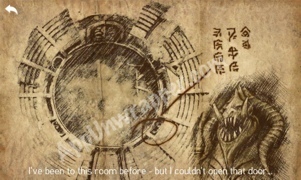 I’ll be posting all the treasure maps here as I find them, along with the locations of the treasures. This is a work in progress, so bear with me, and feel free to help out in the comments section. I’m still working on the Skycages update. Go into the arena, and while you’re facing the second enemy (after the Wretch), turn to your right and tap on the door directly next to you. Your treasure will likely be an attack gem around +25. At the very start of a rebirth, you’ll see this tree. Tap on it to get a treasure (I got a Big Prize Wheel). 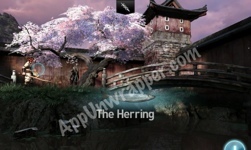 When you face Ronin, tap the water under the bridge to the right and you’ll find the Herring. Sword: A new path opens up near the beginning of the rebirth. Follow it and try to pull the sword from the tree stump. It will turn out to be a monster. Defeat it and it will morph into a bigger and stronger one. Defeat them both to get the Vile Sword. 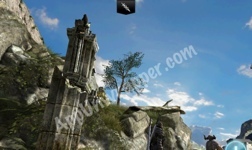 Armor: In the arena, climb up the tree. (If you don’t see a tree yet, you have to wait a few rebirths until it grows). Halfway up there will be a lair with a Gargap. Take his treasure to wake him up, then defeat him to get the Vile Armor. 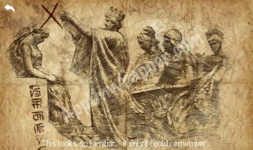 Helm: You need the Crown Map (shown further down the page) to get the helm. Shield: To the right of where you got the sword, there’s a statue of a woman holding a sword. 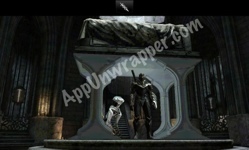 Tap on it and if you have the Infinity Blade, you’ll be able to activate the statue. You’ll have to fight another enemy (of course) to get the shield. Once you have all four pieces of the Vile set (sword, helm, shield and armor), equip them in the Shrine (the room where you tap on the weapon icons to get special equipment). After you defeat the guardian, tap on the stone altar. Take the elevator down to get the Holy Band, which pretty much makes you a god. It has 10 Holy power, which does damage and heals at the same time (like leeching the enemy’s life source). If you wear the entire Vile set, including the Holy Band, you get +30% chance to find rare items. You can also use the heavy or dual Vile weapons instead of the light. 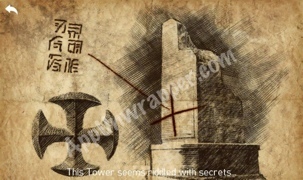 You’ll find it on one of the broken pillars at the top of the tower. 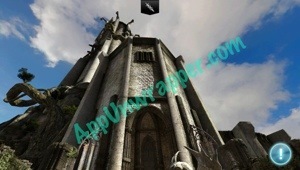 Once you’re up there, look to the right and tap on this pillar to get a key (I got Medium). 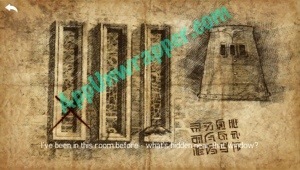 The drawing you see is carved into the stone in the area by the Stone Demon. Tap in the spot shown on the map and you’ll get the Vile Helm. 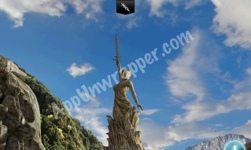 In the valley, to the right of where you get the Vile sword, there’s a statue of a woman with a sword. You need to tap on the sword the first thing you do when you get to the valley, or it won’t work! You’ll get the Warth from this map. I won the Scholar Map through a Prize Wheel. It points to a bookshelf. It’s the second bookshelf you see (not the one where you open a chest). 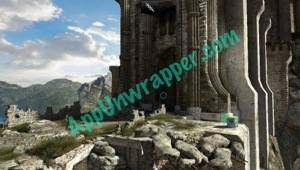 Quickly tap the lower left corner and you’ll get a Glimmer. I looted the Old Treasure Map from an unmarked treasure chest. Near the beginning of your rebirth, after you cross the bridge, you’ll fight an enemy. After you defeat him, look to the right and tap where it shows on the map. You’ll get a Large Key. I looted this map off an enemy. In the courtyard, right above the dragon statue, are the three windows. 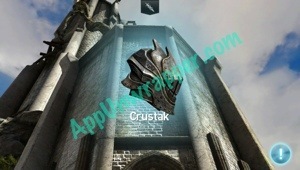 Tap on the lower part of the left window and you’ll get a Crustak, a helmet you may already have. 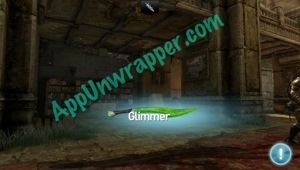 You can buy them yes, but I you try n use these for the rainbow defense gem it won’t work. do you forge light gem,dark gem, and last hexogon gem, or light gem,hexogon gem, and last, dark gem? I got all the maps. The only thing I can’t figure out is what armor and what helmet that is. I got the shield by opening the statue and fighting the big golem monster. And I got the vile sword after killing the two tree monsters. 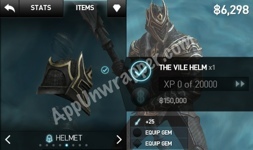 If I could figure out the helmet and armor then I could open the casket. Argh! You’re talking about the Vile Map? It’s the four Vile pieces in that picture. 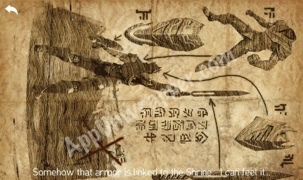 You need to wear them all in the shrine (where you get items by pressing on the pictures of different weapons) to get the Holy Band. You get the armor after killing the Gargap halfway up the tree in the arena. I still need the helmet and shield, but the Crown map seems to be for the helm. I’ve been holding off buying it, hoping that I’ll loot it. for the armour go to the arena, than go up on the tree and kill the bird. What level are you, what items do you have, etc? I’m pretty sure they stay the same level until you kill it, so you might just need to level up more. Some attack/magic/health gems can help. Make sure you have a good healing ring, too. These guys were so hard! I suggest using a large Health Regen potion (+100 health each second during battle) before you start. It will only work for the first guy, but it basically guarantees you get at least halfway through the fight each time. Regarding weapons, just get the beefiest thing you can. I think light and dual work best for the big beasts because you can dodge their bites. 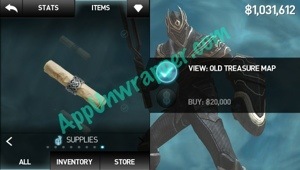 For the helm you buy the crown treasure map and to get the armor, go into the arena and after you fight the wretch (big dog thing) climb up the tree instead of fighting the next titan. 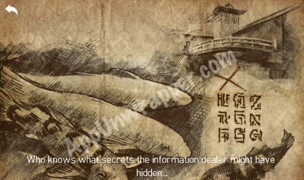 If I want to get the treasure, that’s mean I need the purchase the map 1st although I knew the location. Cause I keep tapping on the screen with the wet loop map can’t be found anything… And if really need to purchase the treasure map 1st how can I get back to the opening place? If I want to get the treasure, that’s mean I need the purchase the map 1st although I knew the location. Cause I keep tapping on the screen under the bridge with the wet loot map can’t be found anything… And if really need to purchase the treasure map 1st, how can I get back to the opening place? Yes, for each treasure, you need to have the map before it will work. 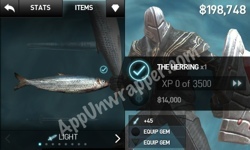 For the wet loot map, if you’re still on that screen, buy the map and then tap on the water. I did that for the crown and it worked. If it’s too late for that, you have to either wait until after you defeat the God King, or reset to Rebirth 1 (make sure you choose to keep all your items, xp, etc. Don’t wipe your save file!). Which one you do would depend on how far you’ve gotten so far. But at the opening I can’t afford with the price like 12 thousand something, any method? Cause you mention that it can’t be reach to the wet loot map again once you have pass. Like I said, you can reach that area again by defeating the God King or resetting back to rebirth 1 (keeping all your items, xp, etc.). dude how do u forge item ?? Did you do it up close or from afar? I got mine when I just entered the room (see my photo). Try it at that point. Make sure you tap on the exact spot shown on the map, above the woman’s head (left side of the carving). I got most of the treasure but can’t figure out the ‘dusty treasure map’…at all. When you go to the place where you get the vile sword and sheild, do not fight anyone, but look at the statue of the lady holding the sword. Tapp the blade of the sword. 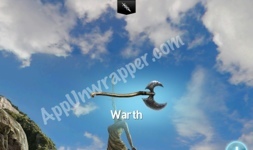 Keep tapping until you get the warth. Where are the treasure maps? You can see the maps under your items list (ie. potions, prize wheels, etc). 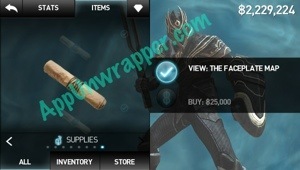 Some can be purchased but others can only be looted. 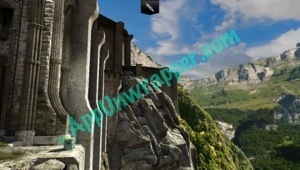 What about the scholars map? U must pull this one offa treasure chest. Oh btw. What’s the cardboard ring called? It’s crazy overpowered! I’ve been breezing through rebirths since I got it. I got the cheapest maps but it seems to only let me use it once? I have then in my inventory. I use it but then I click the spot a million times and it doesn’t pick it up at all? Do you know why? I can’t seem to wake the bird to get the armour.. What have I done wrong? You need to take all the money bags around him to wake him up. I can’t find the arena to get the vile armor. Would someone please post a picture of the arena with tree? How to climb the tree!? The colosseum/arena is through the door to the left of that knight/dragon statue. You might not be able to climb the tree right away. I think I only saw that option after a few rebirths, but could be wrong. The tree grows after a few rebirths in game, so visit the arena, then wait a few rebirths and come back. you’ll begin to notice a tree is growing. wait till that tree encompasses the whole entire tower, that’s when you can climb up. Ah ok so I wasn’t imagining it. Thanks, I’ll update the guide. 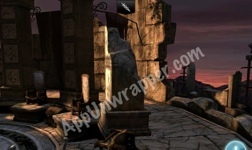 go down from new path in the beginning of the game (where you go to get the vile shield and sword) there is a statue (A lady holding a sword) where the titan that is sleeping in the tomb with the Vile Shield,turn your screen to the sword in the hands of the lady statue and tap on it. 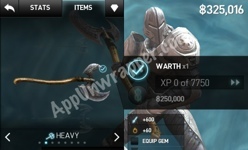 it will unlock a heavy sword. As I find any, I’ll add them to the list. 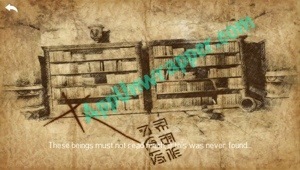 Where can I find Worn treasure map? You have to loot it. I believe I found mine in a chest. 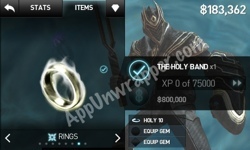 Where can I find that secret ally,I have found all of the secret items(like the holy band and stuff)but I cant find the secret ally anywhere! Help please!! You sure you’re not just talking about TEL? 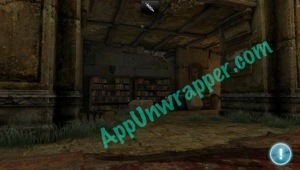 I have gotten all the maps, but can they be re-used in any way? I’ve looted all the treasures and all I can say is I feel scammed when I pay a bunch of gold for just a single key. I assumed they could be used more than once in the same location, but it looks like that might not be the case, anyone know for-sure? Even if it can only be used once, I wouldn’t feel scammed. That’s how it works when you buy anything in the game. I think the maps were just a way to make it a little more interesting than simply buying the equipment. I have the tree map. I looted it from an enemy. It respawns every rebirth. Does anyone know where is the faceplate map? Does anyone know what the faceplate map says? 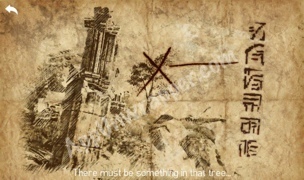 The “Old Treasure Map” indicates an object just to the upper right of the castle entrance. 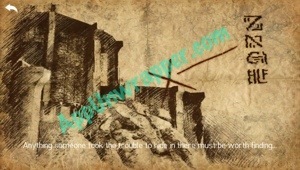 Click on it just before entering the castle and after defeating the titan at the bridge. 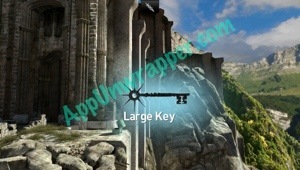 I found a large key. I got the Crowns Map but it won’t let me get the Vile helm. but then i updated it and there was this guy with black armor and laser sword… i started rebirth 1 and now he isnt there anymore… any explanation? ?